Materials needed: water bottle, harvest colors of tissue paper, glue, glow stick, yarn. Directions: Have the children tear small pieces of tissue paper of many colors. The children can glue the pieces to the water bottle covering the outside. Put the glow stick inside the water bottle and put on the cap. Cut the yarn about 12 inches, and tie the ends to make a circle. Make a loop over the top of the bottle under the lip so the bottle can hang from the yarn. 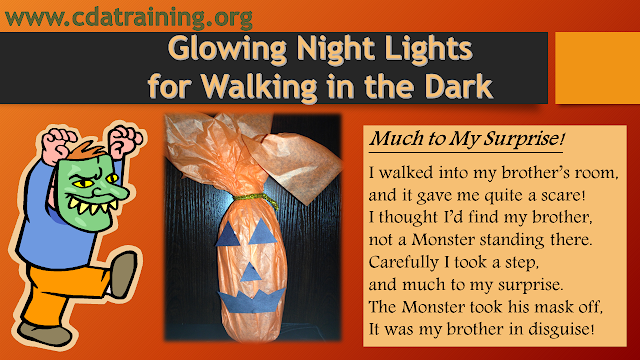 Children can take it with them trick or treating to be seen in the dark.